The people pictured below have been identified by activists, lawyers, and occasionally in open court, as snitches for the FBI. The cases against eleven activists recently indicted for alleged eco-defense actions are reportedly built largely around the statements of these snitches. Stanislas Meyerhoff was one of the Eco-Eleven arrested, but cut a deal and started talking. 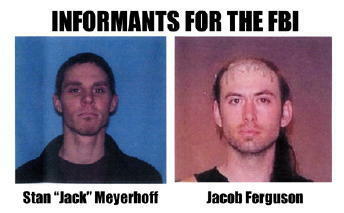 Jacob Ferguson is still on the outside and reportedly wears a wire for the FBI. 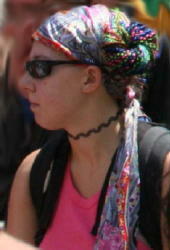 It appears "Anna" has always been an informant and has attended numerous radical gatherings and demonstrations. Reportedly she is in Auburn, CA, where she got three of the Eco-Eleven arreested. 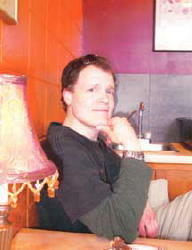 Kevin Tubbs, like Stanislas, was arrested as one of the Eco-Eleven, but has since cut a deal with the Feds as well. I imagine some may see this as petty, but it is no joke. In part because of the actions of the above individuals, numerous people are facing the possibility of life in prison. Snitches are traitors. Those who entrap people or sell out their friends and the struggle to cut a deal do not deserve any support - only condemnation. Not to mention that "almost 20% of the identified wrongful conviction cases involved "snitch" testimony." -- Did the accused and arrested persons commit crimes? -- Were they charged with crimes that have been legislatively defined? -- Will they be tried in accordance with the law and the traditions of judicial procedure? -- Will a jury of their peers have the opportunity to convict or acquit them? -- Or are these questions, which go to the heart of the process Americans call justice, of less interest to you than that persons who share an ideology with you have been hailed before a court to answer for some of their deeds? God only knows what other groups have been infiltrated with "snitches"- Arab American groups, Move On, Drinking Liberally. I wonder if these snitches encouraged criminal activity just so they were convicted. by "eco defense action" you mean eco terrorism right? I know Kevin Tubbs personally and have read through thousands of pages that made up his indictment, transcript and FBI file. The information web sites have used to label him a snitch is erroneous. There is NO mention in his indictment or FBI report of any cooperation other than his willingness to give up the right to appeal his sentence in exchange for a guilty plea. He is still incarcerated while others involved have already been released or are close to it. If you can find documented evidence of snitching, I will pay whoever finds it $1,000.